Wasps are probably the most common domestic pests in the summer, tending to be active between May and October. They are very aggressive and attack and sting repeatedly anything that disturbs them or their nest – that could be you, people nearby and your pets! You may see an off-white papery cone, which can vary greatly in size. 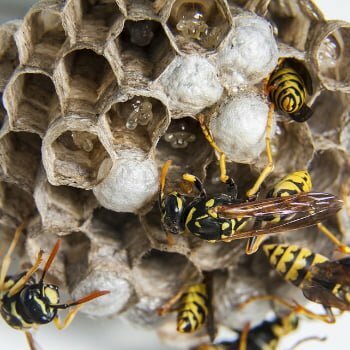 If the wasp nest is hidden under slates or in a wall then you might spot wasps flying in and out of the wasp nest entrance, especially in warm, sunny weather when the wasps are more active Sometimes you can hear noises behind a wall or ceiling made by wasps working in a nest on the other side.